Over the last year or so, we’ve seen an auspicious rise in the number of startups looking to tackle those seemingly intractable problems in both K-12 and higher education. One of these startups, the New York City-based ShowMe, found some early financial validation from an impressive set of investors, raising $800K last August from the likes of Lerer Ventures, SV Angel, betaworks, Learn Capital, and angel investor Naval Ravikant. Those familiar with Khan Academy — the startup that offers an impressive web library of videos on everything from arithmetic and physics to finance and history to let students learn at their own pace — will likely find it easy to understand ShowMe’s appeal. The startup is taking a bottom-up approach to the Khan Academy model. While Sal Khan (the founder and head teacher of Khan Academy) has proven to be an incredibly skilled instructor, procuring the equipment, software, and resources that have allowed Khan Academy to thrive is difficult to say the least. Creating that depth of quality content and building a sizable user base requires a lot of time and significant financial backing. Thus, ShowMe wants to bring the classroom-flipping power of Khan Academy’s platform to the millions of teachers out there looking to share their knowledge and experience with students of every age. “We want to create thousands of Sal Khans,” ShowMe CEO San Kim tells us, taking Khan’s approach and turning into a community and P2P-based model. To do so, the startup built an iPad app (with a corresponding web platform) that transforms the device into an interactive video whiteboard, allowing teachers of all stripes to record lessons while speaking into the iPad’s microphone and drawing on the accompanying touchscreen whiteboard. Once those instructors have created a video, they can then be shared on the app or on the Web, where other users can peruse through videos, voting them up, and sharing their own favorites. Since the app debuted on the App Store last summer, it has racked up over 400K downloads (which is impressive for an educational app), and Kim tells us that ShowMe teachers have now created over 1.5 million lessons. ShowMe’s technology is also now powering Princeton Review’s SAT prep app. Behind this early traction, the startup is today officially launching version 2.0 of its iPad app and Web platform, which turns ShowMe into a central hub where all lessons can be posted and searched for, bringing lessons posted from a teacher’s iPad directly into the web platform for easy searching and sharing. ShowMe initially started off as a standalone iPad app, which Kim says was a big hit among K-12 teachers. What surprised the team was how eagerly this growing community of teachers began sharing the lessons they created on Twitter, blogs, and beyond. And, again, while grade school teachers were the primary target for ShowMe’s whiteboard, with its new online content hub, the startup wants to make it clear that the technology is meant to be used by anyone who has knowledge or lessons to share — whether they be writers, musicians, artists, chefs, etc. 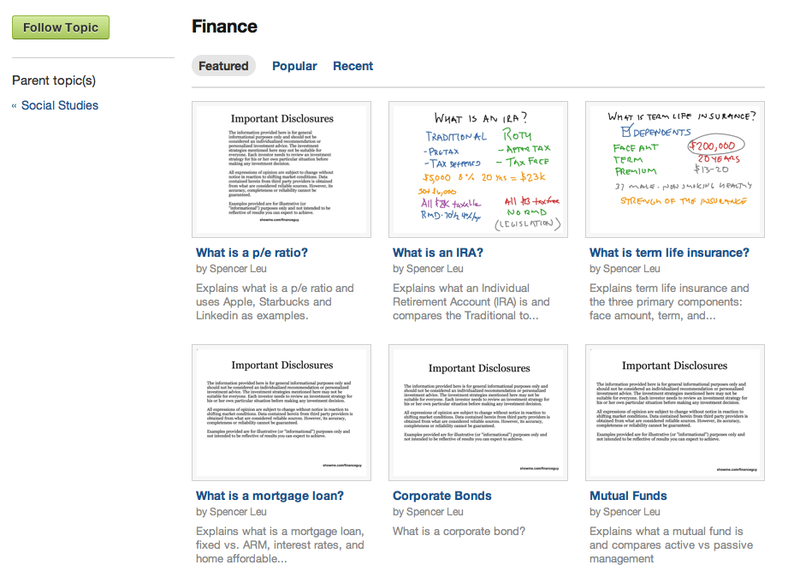 ShowMe’s lessons are now aggregated on the Web in one place, as users can browse through featured videos, or jump to “All Topics,” to peruse by category. As to who is in charge of these 1.5 million lessons, Kim says that the community itself is the gatekeeper of the content, which crowdsources and filters the best content and groups it into categories. As to what’s up next? The CEO says that the next step for the company involves enhancing these filtering mechanisms so that it can curate and organize its content in a way that’s personalized to individual learners. Everyone has a different learning style, and with thousands of teachers producing content on ShowMe, the key going forward will be finding the best way to match those various styles with right teachers. The beauty of ShowMe is that it takes the whiteboard out of the classroom and puts it in students laps, so that they can continue to learn and practice lessons when they’re not in school, in a much more engaging and multidimensional world, thanks to the iPad. Opening up its library of lessons to the general public, and enabling easy search and discovery, is an important step for ShowMe in its progress toward bringing high quality education to the masses.